A Jefferson woman has been sentenced to jail and probation for two August incidents. According to court documents, 25-year-old Hayley Brown made an adjudicated guilty plea for two Class D Felonies for second degree theft and possession of a firearm by a felon, and a serious misdemeanor for fourth degree criminal mischief. She had her two five-year prison sentences suspended for the felonies and was placed on three years of probation with the Department of Correctional Services. She was also ordered to serve six months in Greene County Jail for the serious misdemeanor. Her jail sentence is to run concurrently with her guilty plea of two serious misdemeanors for possession of marijuana and an OWI. She was ordered to serve two days in jail for each charge. The charges stems from an incident on August 8th. She broke into a residence and stole some items, including two handguns. 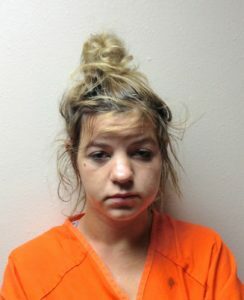 Later that evening, she was stopped and arrested for an OWI and when officers did an inventory of her vehicle while it was in the impound lot, they found marijuana. Altogether, Brown was ordered to pay over $4,000 in fines, surcharges, court costs, attorney fees and victim restitution.